OTRcat.com posts: Freedom USA was a political melodrama which took listeners "into the Senate chambers, the cloakrooms and the private offices or political Washington." Freedom USA attempted to give a dramatic inside view of United States Senate happenings from the honest and good hearted Senator Dean Edward. Tyrone Power (best known for his role in films as a romantic swashbuckler) portrays Senator Dean Edwards, who investigates the people and powers behind the bills of Congress. From twisty-mustached revolutionaries to corrupt lumber barons from smearing journalists to communist kidnappers named Andre, Senator Dean Edwards faces them all with the bravado of a private investigator and smoothness with the ladies. Series announcer was Jimmy Wallington. 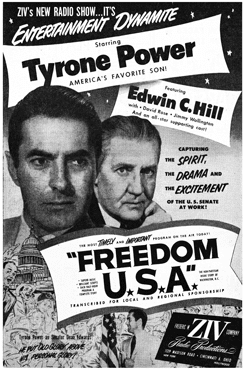 Freedom USA was syndicated in 1952, commercials were added locally.